Divine Chaos: COD Blog Party - #7: Naughty or Nice? OOOOH, I switched it up on you today, huh? You came on here lookin' to the left, and oh, what's this...it's on the right. I like change. Can't help myself. The only thing that stays constant in my life is my family. Only because I can't control that, bwahahahaha! 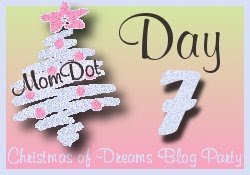 Anywho, it's day 7 of the blog party. Can't believe I've blogged a week straight. Crazy I tells ya! Thank you MomDot for giving me something to ramble on about for a whole week. Thankfully it's not quite over yet. So we've covered traditions, and budgets. Even the memories. Today we are talking about the list, and who is on which one! Tell us who is on your naughty list? Who is on your nice list? Why? Naughty List: The chick at Verizon! You know who you are. The person who made my cheeseburger at McDonalds yesterday. I said PLAIN CHEESEBURGER! I made your job a whole lot easier and you had to go and screw it up. Plain = NO ketchup, NO mustard, NO pickles, NO ONIONS! My husband. He's the naughtiest of them all. TeeHee! Nice List: My husband. He's so naughty it's nice. Sure we have our ups and downs but here we are, 7 years strong and still going! He puts up with so much from me. Especially what comes out of me. Yes, I fart pass gas. I have no shame. I will let it go when the moment presents itself (excluding most public places). Yet he still loves me, and hasn't' yet left me, though he has mentioned it being grounds for divorce. Of course my children. Even when they are so bad they make me smile. I wish I could give them everything they wanted and more. Though I do try. Their "want" list is never ending. No really, it is, I assure you. My friends. Especially Darlene, Angie, Jessica, and Elyse. You are always there for me when I need you. No matter what. If I won the lotto you know I'd spot you a couple mill! You da bomb diggity yo! Fo shizzle. If I know Elyse she's shizzlin' me back. HOLLA! My family! I miss them. I hate when McDonalds does that. I ask for plain with just ketchup, and they feel like they need to add extra ketchup to make up for everything else, so that it is leaking everywhere! glad you got more nice than naughty! Why does McDonalds always do that? I pretend I'm allergic to the other stuff and make them feel really guilty that they could have killed me. Yes, I'm bad. Every time I have to go to Verizon, I come out with a new name to add to the naughty list. They are so irritating! I don't get it. Wouldn't you think those grill guys would appreciate someone who wanted it simple? How can they mess NOTHING up? Jeepers people! LMAO at your naughty/nice husband. Too funny!! !